Before the Act of April 2nd, 1792, American was a fledgeling country and had not yet minted its own currency. Because of this, they would use currencies from different countries which had been approved by Congress. Out of all the different countries and currencies that America used during this period, it was the Escudo that was recognised as the first gold ‘dollar’. 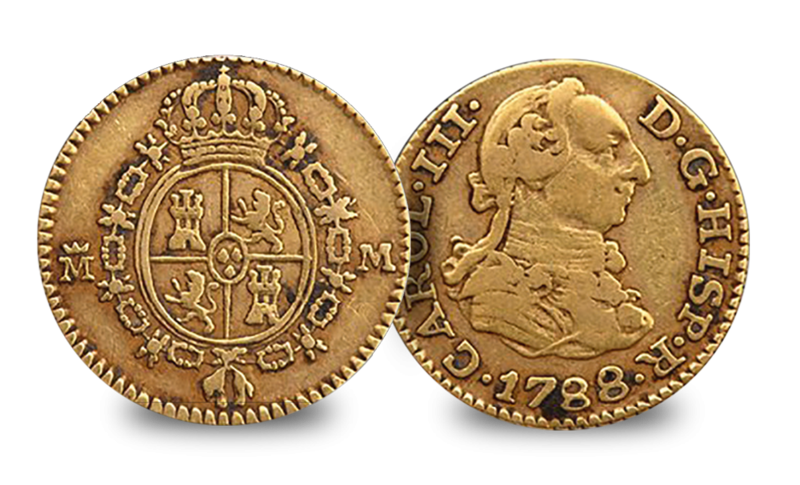 Spanish Half Escudos minted at Seville and Madrid during the reigns of Philip V (1738–1746), Ferdinand VI (1746–1759) or Charles III were particularly popular. Valued at one dollar, these foreign coins became, in effect, America’s first gold dollar coins. Minted between 1759 and 1788 the obverse of the Half Escudo featured a draped profile bust of the King of Spain facing right, below him the date of the coin and to the left his name. The reverse features a shield under a crown within a Golden Fleece order collar, the denomination is featured partly to the left of the shield to give the value of the escudo. When gold was discovered in California (1849), the USA was finally able to mint its own gold coins and in 1857 foreign currency was banned when US coinage became the only legal tender. Given the age of these coins - over 220 years, they are extremely rare today - with many lost or melted down.